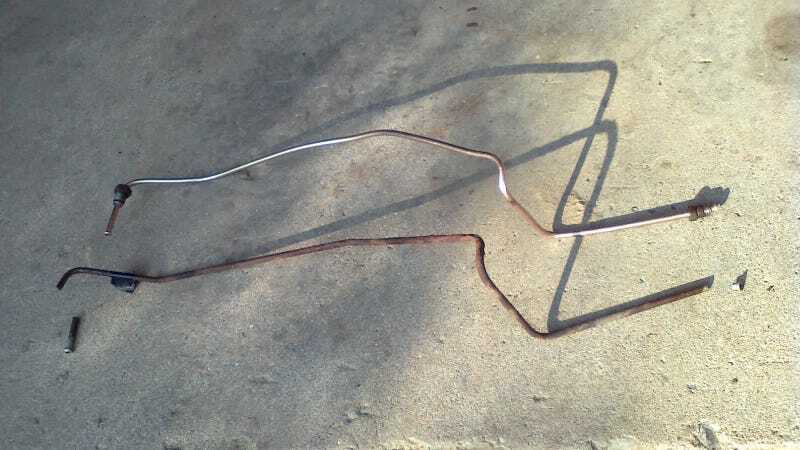 A few years ago, I was introduced to the wonderful world of rust-free copper-nickel tubing, for brake lines. I think the stuff is awesome, but how awesome is it, really? This post originally appeared on December 08, 2017. Here in the US’s rust belt, the steel tubing often used on domestic cars for brake and fuel lines has a very limited lifespan. It can rust out enough to spring a leak in as little as ten years. Repairing those rusted-out sections (or entire lengths) with new steel tubing can be a bit of a hassle, particularly if you’re fabricating the lines yourself. One alternative is to purchase pre-bent lines, but these can be expensive to purchase, delicate to ship, and sometimes even require removal of major components (like a fuel tank) to install. And if they’re (non-stainless) steel, you can look forward to replacing them all over again in another ten years, just like you would had you fabbed the lines yourself. Sure, you could buy yourself some time by going with with poly-coated steel, but in salt states, that still only buys you a limited amount of time, compared to rust-free options. If you really want to solve the corrosion issue once-and-for-all (without moving to a more friendly climate), there’s always stainless tubing. But aside from the higher cost (which might actually be worth it in the long run), stainless steel can be finicky to work with due to the hardness of the material. It’s not quite as easy to bend, flare, or seal as regular steel is (not that regular steel is a walk in the park). But the main attraction here is this stuff’s corrosion resistance. Copper-nickel tubing is rust-free. It does oxidize, but it won’t rust out the way steel does so catastrophically. If that wasn’t enough of a selling point, the softer material also makes it a dream to work with. It’s so much easier to form, to the point where if you’re careful, you can even bend the tubing by hand without crimping it and causing a restriction. It flares easily, and readily conforms to make a seal when tightened into place. You do pay for it, though. Depending on where you purchase it from, nickel-copper tubing can run higher or lower than stainless, but always significantly more than cheap ol’ steel. But when you look at the job ahead of you, and the potential lifespan of the tubing, that higher cost can quickly start to look rather negligible. Sound too good to be true? You’re not alone. Visit just about any online message board discussing this stuff, and you’ll find folks who are automatically suspicious of using anything softer than steel. They’ll make the argument that it’s just not worth the risk of failure. After all, just imagine the consequences of losing brakes! Or springing a fuel leak! But when it comes to these discussions, it’s important to understand the material, it’s strengths and weaknesses, and consider its application. Like how some vehicles have wheel bearings that are held in by castle nuts... when it comes right down to it, the entire wheel of the car is ultimately held onto the spindle by... a cotter pin! This doesn’t mean that the car is inherently unsafe, or that the cotter pin needs to be made out of adamantium. There IS such a thing as “good enough”, even when it comes to safety. And it’s also worth noting that some of these discussions throw around the word “copper” in such a way that makes you wonder if we’re still talking about copper-nickel tubing, or just plain copper, which you do NOT want to use for something like this. The nickel, iron, and manganese content present in the alloy are key ingredients to roadworthiness, improving fatigue (and general) strength. But there’s another line of reasoning against copper that caught me by surprise. They call it “copper corrosion”, which has something to do with ions and the metal breaking down from the inside. At first glance, there doesn’t seem to be a whole lot of information out there about it. It’s something different from moisture contamination. Unfortunately, articles on the subject range from long-form sleep-inducing technical gobbledygook to what almost comes across like a fearmongering upsell opportunity for shops to increase their profits. Thanks to the limited information available, skepticism about this interior corrosion runs high, especially in this thread. But where is the copper even coming from, anyway? Well, as the video above mentions, your “standard” steel brake line isn’t exactly as simple as it sounds. There’s a lot more copper in a steel brake system than just your banjo washers. There’s a copper coating on the inside of the tubing, too. So you can’t escape copper corrosion by using steel. Because of its vulnerability to external rust, steel remains more likely to spring a leak than copper-nickel tubing, despite Cu-Ni’s somewhat lower pressure ratings. But leaks aren’t the main concern when it comes to this internal corrosion. I can’t find any reports or suggestions that copper corrosion causes brake lines to leak externally. Rather, they all tend to focus on the particles finding their way to the ABS components and wreaking havoc there. So it would seem that whatever corrosion does take place inside these lines, happens at a much slower rate, and a much smaller scale than the exterior rust that steel lines are prone to. But that relatively small amount is still enough to mess with ABS parts and cause problems. To combat this internal corrosion, you’re better off turning your attention away from the brake tubing material, and looking at the fluid instead. Brake fluid contains corrosion inhibitors that lose their effectiveness with heat and age. It gets a bit complicated, and a lot of the chemical stuff goes over my head, so I can’t speak to how effective inhibitor replenishers like “BrakeShot” really are. But better than any additive, is simply changing that fluid on time, regardless of whatever material your vehicle has for brake tubing. Maybe you’ve already discovered for yourself how AMAZING the brake pedal feels after pushing some fresh fluid through the system after a repair. (That probably has more to do with purging moisture from the lines, than it does with flushing copper particles out, though.) Still, this needs to be part of a regular service, even if it’s not included in the manufacturer’s maintenance schedule. If it’s turned a dark green color, you’re already way behind (come to think of it, is copper where that green comes from? Hmm). Learn how brake fluid helps to make sure your brake system works at optimal levels. So changing brake fluid is an important maintenance item, but not the only item if you find yourself in an area where steel lines are prone to rust. No matter how neat copper-nickel tubing is, steel lines are very good at their job too. They just need some extra attention. If you don’t mind getting underneath the car once in a while, take some time to clean them off and paint or coat the lines to help keep rust at bay. But depending on how those lines are routed, access could be a problem. That’s why I prefer these low-maintenance alternatives. All I have to do is keep the fluid clear. And since changing that fluid frequently means cracking the bleeder screws open, there’s less of a chance of those screws seizing up and breaking. Are there any reasons left to avoid using copper-nickel tubing? Well, maybe impact resistance. If the lines are routed in a vulnerable spot with no mudflaps or shields to protect them during frequent gravel or off-road driving, a random piece of debris could pinch the softer metal.